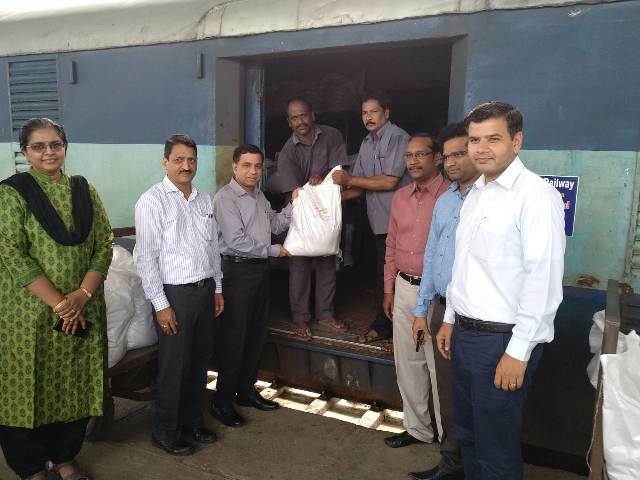 The initiative of Indian Railways, acting o­n the directives of Sri Piyush Goyal, Hon’ble Minister of Railways to provide free transport of relief material to the flood affected areas of Kerala state was taken up concertedly by South Central Railway. In a span of 10 days from 20thto 31st August, 2018, the zone has transported a huge 520 tonnes of relief material free of cost to various flood affected areas in Kerala. Shri Vinod Kumar Yadav, General Manager, SCR drew a comprehensive plan of action by undertaking a special mission “Join Hands for Kerala”. All the six divisions o­n the zone – Secunderabad, Hyderabad, Vijayawada, Guntur, Guntakal and Nanded were involved in the task with the Divisional Railway Managers monitoring the same while Shri John Thomas, Additional General Manager, SCR coordinated the entire relief activity and liaised with the District and State administrations of Kerala. The two pronged plan of action of the zone primarily involved activating the entire workforce of SCR to contribute/collect relief and aid material at various locations all over the Zone. Railway Officers, Staff, Railway families, Unions, Associations etc joined hands to collect the entire relief aid, appropriately pack the same and dispatch to identified locations in Kerala. 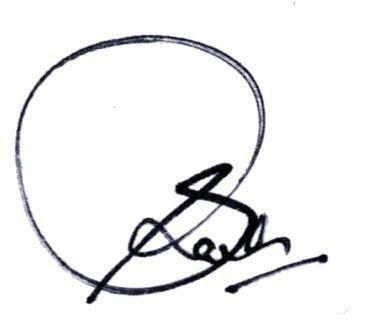 In addition, SCR also lent its total support and cooperation to the State Governments/NGOs/Voluntary bodies/individuals etc who were involved in the task of contributing relief and aid material to Kerala state, by means of setting up specially designated collection centers at all major Railway stations o­n the zone, to undertake free transport of the material bound for various District Collectorates of Kerala. In a record of sorts, a total of 171 tonnes of relief material was collected by the Railway Officers & Staff and sent to Kerala. Various Wings of the state government, NGOs, Voluntary bodies, Philanthropic organizations and individuals utilized the free rail transport facility provided by SCR to send 349 tonnes of relief aid material. The Total relief material of 520 tonnes, collected and dispatched in 10 dayswas booked from various railway stations o­n all divisions of SCR. The unique aspect of the entire relief reach out exercise under mission “Join Hands for Kerala” was the 24X7 control setup at Head Quarters, Divisions and Station level with senior Officers & Supervisors handling the entire work round the clock. The strategy focused o­n identifying each day requirements of the flood affected people and source/transport the aid material accordingly. 48 train services were utilized during the 10 day period for transporting the material from various stations o­n SCR to identified railway stations in Kerala. The Luggage Vans were specifically earmarked to carry the free relief consignment, doing away temporarily with other parcel bookings. 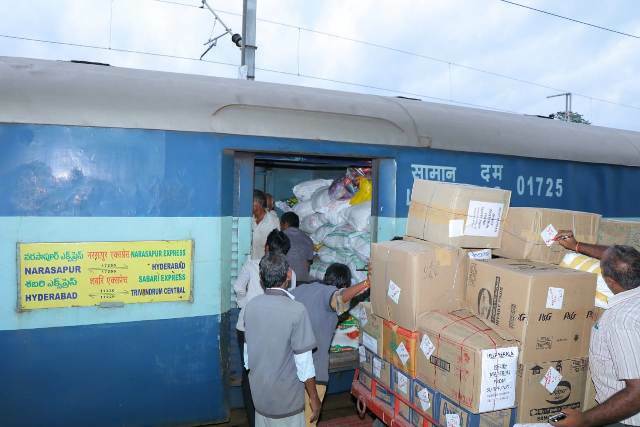 The Stations which handled the relief material primarily are Secunderabad, Hyderabad, Kacheguda, Kazipet, Vijayawada, Guntur, Guntakal, Kadapa, Tirupati, Anantapur, Kurnool City and Nanded. The destinations in Kerala included Thrissur, Shoranur, Ernakulam, Chenganur, Kottayam, Kozhikode and Thiruvanantapuram. The relief material comprised of food items including around 75 tonnes of Rice, 5 tonnes of Wheat, Atta, 9 tonnes of Dal, Sugar, Jaggery , Salt, Cooking Oil, Baby Food, Milk Powder, Snacks, Biscuits, Cakes, Fast Food, ORS sachets, Pickle, Vegetables, Grocery items like Tea Powder, Chilli powder, turmeric etc.“Back to Home”kits were specially made for the people returning to their homes after the flood fury abated. Amongst the other basic items which were transported are – Medicines, Water Bottles, Water sachets, Towels, Blankets, Bed sheets, Lungies, Nighties, Mattress, House Hold utensils, Sanitary Napkins, Baby diapers, Baby Lotions, Soaps, Tooth Paste & Brushes, Mosquito Coils, Footwear, Stationary items, School kits, pens,candles, match boxes etc. Keeping in view the specific requirements to clean the damaged homes, the relief material collected and transported for the purpose included Gum Boots, Cleaning liquids, brooms, brushes, bleaching powder, Naphthalene balls, Gloves, Masks, Plastic buckets & Mugs etc.